News Briefs Formidable pool of speakers from Malaysia & other palm oil producing countries are invited to this yearâ&#x20AC;&#x2122;s 11th National Palm Oil Congress held in Butuan City. They will share their respective success stories for the industry stakeholders in Caraga region to learn from. The Philippine Registry for Persons with Disabilities (PRPWD) is a national registration & reporting system for specific types of disabilities & the issuance of unique identification numbers for discounts & other benefits implemented in coordination with the National Council on Disability Affairs (NCDA). The Rotary Club of Surigao City, a member of the Rotary International District 3860, will award Rotary Gold Medals to 19 graduating senior high school students with exemplary performance. Government employees, private stakeholders and other volunteers joined clean-up drive activity along Ambangan Creek in Butuan City. Also, the Father Sarurnino Urios University, Libertad National High School, Barangays Libertad and Ambago, and PNP Caraga have committed to adopt portions of the said creek as a support to the Adopt-an-Estero/ Water Body Program. BUTUAN CITY - Police Regional Office (PRO) 13 has maintained its number one spot in the Crime Solution Efficiency (CSE) for the month of January and February 2019. According to Senior Supt. James Goforth, Chief of the Regional Investigation and Detective Management Division, PRO13 packed a rating of 89.32% followed by the National Capital Region Police Office with 88.32% as second and Police Regional Office II with 86.99% as third. crime incidents were solved by the police units. Chief Supt. Gilberto DC Cruz, PRO13 Director, thanked the community, other law enforcement agencies and all stakeholders that contributed in the crime solving efforts of the police force. SURIGAO CITY, Surigao del Norte - Aside from the awareness campaign activities this Fire Prevention Month, the Office of Civil Defense (OCD)Caraga, together with the Department of the Interior and Local Government (DILG), Philippine Atmospheric, Geophysical and Astronomical Services Administration (PAGASA), Mines and Geosciences Bureau (MGB), Philippine Institute of Volcanology and Seismology (PHIVOLCS) and Philippine National Police (PNP), is also intensifying the conduct of capacity-building activity for disaster prevention, mitigation and preparedness involving the youth in the province of Dinagat Islands. 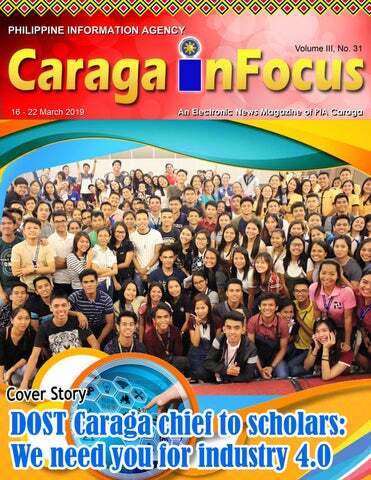 According to OCD-Caraga regional director Liza Mazo, the youth have a very important role to play when it comes to disaster risk reduction and preparedness. Provincial News I Empowering Communities of Surigao del Norte participated in by the women purok officials with the aim of empowering and making them more resilient in times of disasters. According to Diana Lim, head of the capacity-building and training services of OCD-Caraga, these are just among the series of DRRM orientations for the basic society sectors that their agency intends to conduct in the region for them to understand better the hydrometeorological, geological and human-induced hazards, including the practical steps in implementing DRRM in the community. BUTUAN CITY - With the aim to prepare and assist Agusanons before and during disasters that might strike the province, series of trainings on disaster preparedness and response have been set by the provincial government of Agusan del Norte for the month of April this year. According to Erma Suyo, Provincial Disaster Risk Reduction and Management (PDRRM) officer, the PDRRM office in partnership with the Office of Civil Defense Caraga will hold a three-day Emergency Operations Center (EOC) training on April 3 to 6.
its staff to manage information, and mobilize resources in anticipation of and/or to support incident operations. Also, on April 8 to 10 a threeday Training of Trainers (ToT) on Camp Coordination and Camp Management (CCCM) will be conducted. 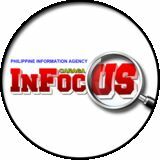 BUTUAN CITY - To fully serve communities in insurgency-influenced barangays in the province of Agusan del Norte, the Provincial Peace and Order Council Oversight and Advisory Committee (ADNOAC) of Agusan del Norte is set to conduct a one-day PPOC Immersion on March 28, 2019 in Barangay Tagmamarkay, Tubay, Agusan del Norte. The event will bring services from different government agencies and private groups to the residents of the four barangays of Tubay, to include residents of barangays Tagmamarkay, Sta. Ana, DoĂąa Telesfora, and DoĂąa Rosario. Provincial News I Empowering Communities and Skills Development Authority, Provincial Health Office, Department of Agrarian Reform-Provincial Agrarian Reform Office, Department of Environment and Natural ResourcesProvincial Environment and Natural Resources Office, National Commission on Indigenous Peoples, Provincial Social Welfare and Development, Philippine Red Cross, Department of Labor and Employment, Provincial Disaster Risk Reduction and Management Council, and Department of Justice-Public Attorney’s Office. Office and other private groups. Expected services during activity will include free medical and dental, vaccination, massage, haircut, legal counseling and many others. Also, food packs will be given to the indigenous people and other residents. Contraceptives will be provided to couples; buntis kits to pregnant women; seedlings to farmers; and fingerlings to fishermen. CANTILAN, Surigao del Sur – The local government unit of Cantilan this province is all set for the 6th Cantilan National Surfing Competition on March 22-24, 2019 in Cantilan town. The second-class municipality headed by Mayor Philip Pichay will host the event supported by Governor Manuel Alameda Sr. The registration for each participant is Php500.00, with the following inclusion: event shirt, welcome dinner and victory party dinner. DAVAO CITY – The Mindanao Development Authority (MinDA) has endorsed seven pilot Agro-Economic Zones (AEZs) in Mindanao to prospective local and foreign investors. Joan Barrera, chief of the MinDA’s Development Division, said the selected pilot areas consisted of strategic production hubs and areas for possible economic activities. “We are inviting investors to these pilot areas,” she said during Wednesday’s Habi at Kape forum at the Abreeza Mall here. Barrera said the establishment of economic activities in the AEZs will be done through Public-Private Partnership (PPP). Barrera said a Malaysian investor is already doing a feasibility study in Lanao del Sur. DAVAO CITY – The Eastern Mindanao Command (Eastmincom) and the Police Regional Office-11 (PRO-11) on Wednesday said the Commission on Elections (Comelec) declaration of Mindanao as election hotspot should not alarm the public. Security Committee on matters relating to security. On Tuesday, the Comelec has declared the entire Mindanao under Category Red for the May 2019 midterm election. Lt. Col. Ezra Balagtey, Eastmincom spokesperson, noted that Mindanao remains under martial law where tighter security measures are in place. This means that places under Category Red have records of politically-motivated violent incidents that may occur during the elections due to the intense political rivalry and have serious armed threats posed by organized threat groups such as the Communist Party of the PhilippinesNew People’s Army (CPP-NPA), the Bangsamoro Independent Freedom Fighters (BIFF), the Abu Sayyaf Group (ASG), and others. “He said people should even feel more secure. This is still in line with the declaration of martial law,” Balagtey said during Wednesday’s AFP-PNP press briefing at the Royal Mandaya Hotel In the PRO-11 EWAS list, Baria said here. there are 823 barangays in Davao Region placed under Category Green; Balagtey said that Eastmincom has 233 under Category Yellow; 86 under yet to receive the Comelec guidelines Category Orange, and 13 under relating to Mindanao’s designation as Category Red. an election hotspot. Police Major Jason Baria, PRO-11 spokesperson, said placing Mindanao under Category Red may have been based on the government’s thorough assessment. The 13 areas under Category Red are all in the province of Davao del Sur, which also has the most areas under Category Orange. CAGAYAN DE ORO CITY - The city government, Nestle Philippines, and Green Antz company opened Tuesday Mindanao’s “Ecobricks” facility that converts plastic wastes into bricks used in construction. The facility, located in the city’s old dumpsite in Zayas, aims to benefit some 300 garbage collectors and waste scavengers who formed a cooperative to manage the business. City administrator Teodor Sabuga-a Jr. recalled that in 2015, the waste pickers opposed the closure of the dumpsite for fear of losing their main livelihood. In his speech, Mayor Oscar Moreno commended Nestle Philippines, Green Antz, and Barangay Carmen officials for the livelihood initiative. MANILA - The Japanese embassy in Manila on Friday has signed five new grassroots projects worth PHP41.78 million, which are focused on improving education, health, and agriculture across the country. The projects, under Japan’s Grant Assistance for Grassroots Human Security Projects (GGP), will be implemented by the GMA Kapuso Foundation, Inc. and the municipalities of Matanog in Maguindanao, Dingalan in Aurora, Balete in Batangas, and Calintaan in Occidental Mindoro. The PHP5.8 million-worth upgrade of the municipal health center in Dingalan is expected to provide comprehensive medical services to 5,000 patients, including 650 pregnant women annually. National News I Empowering Communities about PHP18 million to be implemented by the GMA Kapuso Foundation, Inc. The last grant worth PHP3.9 million is on the procurement of post-harvest equipment and facility for Calintaan farmers. agriculture, social welfare and capacity building in the Philippines. MANILA - The Department of Education (DepEd) is set to take financial education in public schools to a higher level. In a statement Friday, Education Secretary Leonor Briones said DepEd has received the second set of financial literacy videos from Banco de Oro (BDO) Foundation and Bangko Sentral ng Pilipinas (BSP) during turnover ceremonies at the DepEd Central Office on March 13. 28, 2018. The MOA aims to provide lessons on responsible handling of personal finances and manage resources through a financial literacy program in compliance with Republic Act 10922 or the Economic and Financial Literacy Act. online learning portal, focuses on the why’s and how’s of saving. They are now being used for classroom instruction and teacher trainings nationwide.